SanDisk has taken the unveiled the world's first 1TB SDXC card, doubling the current maximum capacity seen with all other memory cards. 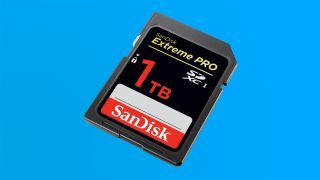 The new 1TB SanDisk Extreme Pro SDXC UHS-I memory card only exists as a prototype. However, just two years ago at Photokina 2014 SanDisk announced 512GB capacity card that was later released a few months later, and so we're hoping events will unfold the same way again. This amount of storage is becoming necessary with flagship cameras from the likes of Canon, Sony, Nikon and now Fujifilm's medium format camera all featuring 50MP sensors. What's more, 4K and 8K video capture along with 360-degree footage is already pushing current storage standards to their limits.